Good News to all of our kababayan (countrymen) who were hard-hit by #TyphoonYolanda. 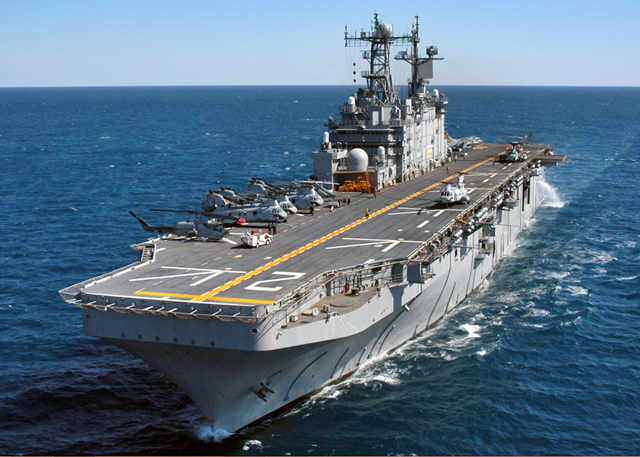 Three(3) US Navy amphibious ships are on their way to the Philippines to help victims of the devastating Typhoon Haiyan (Typhoon Yolanda). The Pentagon announced last Monday evening that it is dispatching the aircraft carrier George Washington and its accompanying cruisers and destroyers, including its fleet of helicopters and airplanes. The U.S. carrier can produce 1.5 million liters of clean water per day from its distilling plant. It will also be used as a platform for planes (landing and take off). The carrier group is due to arrive on Thursday or Friday. Germantown, amphibious warfare ships designed to transport and launch landing craft. All of them have landing decks that can serve helicopters as well as medical facilities and the capability to produce desalinated water. Another naval destroyer and a supply ship are also en route to the Philippines. 243 US Marines are now on the ground in hard-hit Tacloban in Leyte to carry out an initial assessment of humanitarian needs. Hang on. Be strong. Help is on its way. God bless all of you.